Description	 MS in Sumerian on clay, probably Larsa Babylonia, 2000-1800 BC, 1 tablet, 8,1x6,5x2,7 cm, single column, 26 lines in cuneiform script. Context	 5 other copies of the Antediluvian king list are known only: MS 3175, 2 in Oxford: Ashmolean Museum, one is similar to this list, containing 10 kings and 6 cities, the other is a big clay cylinder of the Sumerian king list, on which the kings before the flood form the first section, and has the same 8 kings in the same 5 cities as the present. A 4th copy is in Berkeley: Museum of the University of California, and is a school tablet. A 5th tablet, a small fragment, is in Istanbul. Commentary	 The list provides the beginnings of Sumerian and the world’s history as the Sumerians knew it. The cities listed were all very old sites, and the names of the kings are names of old types within Sumerian name-giving. Thus it is possible that correct traditions are contained, though the sequence given need not be correct. The city dynasties may have overlapped. It is generally held that the Antediluvian king list is reflected in Genesis 5, which lists the 10 patriarchs from Adam to Noah, all living from 365 years (Enoch) to 969 years (Methuselah), altogether 8,575 years. It is possible that the 222,600 years of the king list reflects a more realistic understanding of the huge span of time from Creation to the Flood, and the lengths of the dynasties involved. The first of the 5 cities mentioned , Eridu, is Uruk, in the area where the myths places the Garden of Eden, while the last city, Shuruppak, is the city of Ziusudra, the Sumerian Noah. Published	 Jöran Friberg: A remarkable Collection of Babylonian Mathematical Texts. Springer 2007. Sources and Studies in the History of Mathematics and Physical Sciences. Manuscripts in the Schøyen Collection, vol. 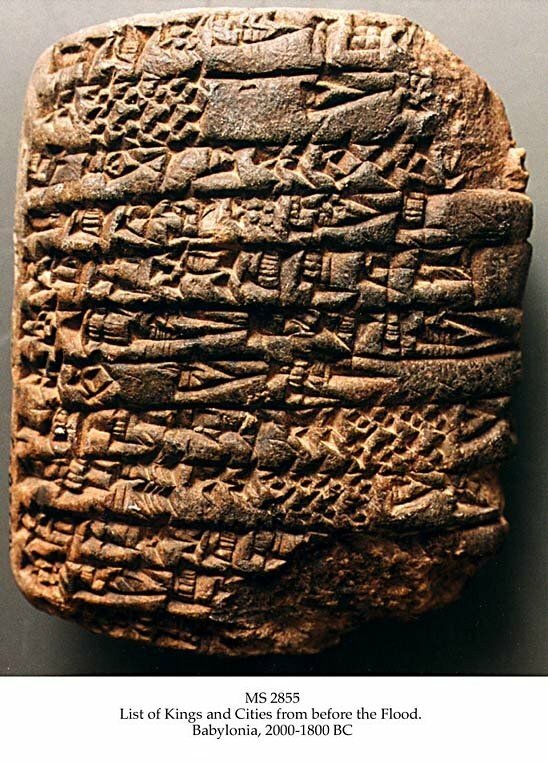 6, Cuneiform Texts I. pp. 237-241. Andrew George, ed. : Cuneiform Royal Inscriptions and Related Texts in the Schøyen Collection, Cornell University Studies in Assyriology and Sumerology, vol. 17, Manuscripts in the Schøyen Collection, Cuneiform texts VI. CDL Press, Bethesda, MD, 2011, text 96, pp. 199-200, pls. LXXVIII-LXXIX. Image featured in	 Andrew E. Hill & John H. Walton: A survey of the Old Testament, 3rd ed., Grand Rapids, Mi., Zondervan Publ. House, 2009, p. 206. Zondervan Illustrated Bible, Backgrounds, Commentary. John H. Walton, gen. ed. Grand Rapids, Mich., Zondervan, 2009, vol 1, p. 482, vol. 5, p. 398.